The Rural Root Six Drawer Weathered Chest is handcrafted from weathered, rough cut pine, giving you the impressive look of reclaimed barn wood without the cost of the real deal. 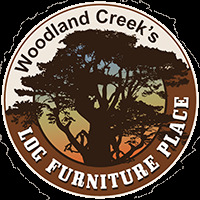 The rustic furniture is carefully sanded to provide a smooth feel while still maintaining the natural weathering and wood grain. If you're a fan, check out the rest of the Rural Root Bedroom Collection. Choice of Euro style drawer glides or upgraded full extension drawer glides.